“The only constant in the world is change”.. that old quote is amazing, because it is so true no matter how deeply you think about it. For thousands of years, the natives of this continent lived a pretty constant lifestyle: hunting, skins, lots of cool techniques and tools, but only very small changes over hundreds of years. From 1900 to the 1950s, people were shocked at the advancements of things like cars, television, and washing machines. Technological change was much faster than that of the 1800s, but it STILL seems slow to us by today’s standards – 30 years later in the 1980s, televisions and washing machines were still pretty clunky. in the 1980s, a few people got computers. In 1993, the Internet started to catch on. In 1999, everyone had several computers and internet access.. and cell phones had monochrome screens. In 2007, the Apple iPhone 1 stunned the technology world by taking everything previously invented and putting it in one sleek touchscreen tablet. In 2011, we are on our fourth version of the iPhone which makes the third version (from 2009) look like a hopeless caveman relic.. yet even the iPhone 4 is only months from being obsolete when the iPhone 5 comes out. This long introduction is not the most concise way to get to my point, but it’s fun to remind you of this trend of acceleration so you can use it to your advantage. You see, we humans are actually not very good at noticing accelerating trends. Maybe because all of our evolutionary history was spent in times of very slow social change. So if you ask an average modern person about what things will be like 10 years in the future, they will look back 10 years in their life, estimate the amount of change that has happened in that time, and tack on that amount of change to the present world to guess what the future will be like. They will totally miss the exponential rate of change, which means the future will surprise them. I like to have a chuckle occasionally at the “peak oil” movement’s projection of future oil demand. These people say, “Well, our oil consumption doubled over the last 10 years, so in future decades we’ll double again, and again, and aaugh, we’ll all die when there is a huge shortage in the year 2040!!”. What they are missing is things like the acceleration of the solar panel – scientific novelty in 1954, widespread on every kid’s calculator in 1990, expensive but powerful system to power a house in 2000, affordable and widespread on millions of rooftops in the US southwest in 2011… dirt-cheap and the only way anyone gets power for anything in the exponentially near future. And even my prediction will quickly sound hokey and old-fashioned because I can’t predict what unforeseen things will be invented the next few decades. And now, finally.. getting back to the point for our students: because of this exponential change, our world is awash in almost-new consumer products. The hottest ones are in the stores, and the hottest ones from just a few months ago are abandoned in people’s drawers and garages. You almost NEVER need to buy anything new, because you can have an almost-new item for 25-50% of the cost out of one of these drawers. People are so accustomed to buying new things, that they are willing to almost give away their used things even when they are barely used. In the 1980s, this type of shopping would be less fun: people kept their fridges until the handles fell off, and their Sony cassette walkmans weren’t obsolete until years after they were bought and they started eating tapes. You’d replace it with a slightly smaller cassette walkman that had been upgraded to include red plastic instead of black. Cars had shorter, more maintenance-intensive lifespans. And there was no Craigslist, so moving used goods was a costly and time-consuming thing to attempt. But today, and increasingly so in the future, we have reached a point where a rational consumer should see very little difference between new and used things – and you, rational consumer, should be buying very little new product. I actually value used items more than new ones, because I like the idea that I prevented one new item from being manufactured in some toxic factory in Beijing. In the grocery store, we willingly pay more for Organic, Green, and Recycled things, but buying a used car, or fridge, or shirt, is actually cheaper than a new one even though it is much more friendly to the Earth! Analyze why you want the product – and if it would actually make you happier given your already-lacking free time: “I want the van because it will help me carry more tools and make me efficient. And I could use it for family vacations too”. If the desire to purchase persists, start shopping for the item on Craigslist. Find the best deal, and only once you have enough cash on hand to buy it with no loans, and without compromising any of your other money goals, go ahead and buy it. If no suitable items come up on Craigslist after several weeks/months of searching, you may consider buying it New. When I first wrote this article in October 2010, I was still not quite to step 5 with the van, and I would never get to #6 since there are plenty on Craig’s. 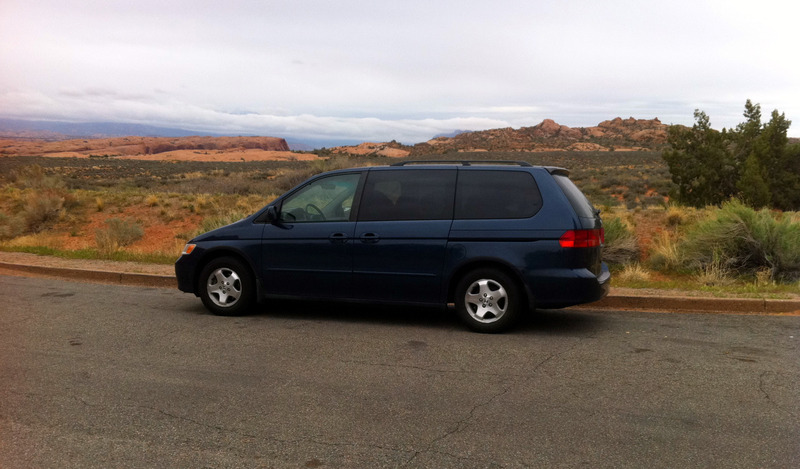 But in February 2011, I eventually did make the purchase, and I was content knowing that I got what was somebody’s $32,000 dream luxury van in 1999, and is really amazingly close to being as useful as a 2011 van.. for the pocket-change amount of $4800. That’s life on the trailing edge! Hey, thanks a lot! Coincidentally, I AM a bit of a secret fan of the Early Retirement Extreme blog and of Mr. Jacob Lund Fisker. I discovered ERE doing a random Google search of something like “Early Retirement Frugality” and there he was, this other guy just like me who had retired young, PLUS written a blog that got a huge following and made an e-book that seemed to be selling well. Just found your site via Hacker News. Loving it. Glad I saw this article since we need to buy a car, and were tempted to go with on of the 0% APR deals on a brand new one. After reading this post, I am newly motivated to try and find a good used car. I might just have a pessimistic view of how many miles to expect out of a car before major repairs are required. Do you know any good resources that show the “life expectancy” of a car in miles? I usually consider a good car’s low-maintenance lifespan to be between 150,000 and 200,000 miles. So in that case you might be looking for a 110k to 160k car. You MIGHT be seeing the last effects of the Japanese Tsunami. That slowed japanese car production so much over the summer that the new and used car inventory was eaten up somewhat. We bought a used car this spring, and had trouble getting what we needed in our area — we settled on something like a Mazda MPV, and just couldn’t find any in Craphole, TX, where we live. After a bit of research, we found that it only cost $350 to have a used car that we found in Houston shipped to us — a distance of over 500 miles (800 km for our mustachioed, Canadian friends). Anyway, we found the dealer on Ebay, so you might want to try spreading your net a little wider than just the Bay area and surrounding suburbs/exurbs. Awesome Tip!!! I had never even thought of that one, but it is ideal for the man who just asked us all what to do about the fact that used fuel-efficient cars are all priced 50% higher than they should be in the San Francisco area. Also, Craphole, TX is an excellent name. I’ve been reading your blog over the last few days – great stuff! I’m 21 and can relate to the idea of retiring early. Anyways, this article really tickled me. I bought a used iphone off a friend early in the summer for about $50. He had bought it for around $300. Then all summer I used an app called “textfree with voice” to have free unlimited texting on my phone (and computer) whenever I had wireless. Wireless is very available so from May-September I used a $50 phone and paid nothing for texting or talking. A few of my friends joked about how sometimes I would take a while to respond but I don’t see the need to be constantly available anyways. I haven’t done the math but I figure it was a decent investment. Now I’ve moved out of the country and can still text friends for free through my computer. Great blog, keep it up! Wow. I’m in the same exact place. I have a Ford Ranger, I do a fair amount of handy work, and I have a kid on the way. I’ve been mulling over the idea of selling the truck and getting a minivan for the family-friendly aspect, but there seem to be so few times that I’d actually need all three rows of that minivan that I’m putting it off until the wife is about ready to kill me. Sadly I haven’t been able to find a texting app that works outside of the states. Loads of apps to text but both parties need it and imessenger is a piece of crap. Have you tried Viber or Talkatone? Viber requires both parties to have the app, but it does free text and voice, and I find I can use the voice over cell towers (non-wifi) unlike most other apps (although I’m not in the US, so maybe it would be blocked there). Talkatone requires wifi, but it hooks into (free) google voice, so it’s handy for calling/texting with people who aren’t on the app – I use it sometimes to call my parents on their landline phone in the US. Just found this blog, and I’m really enjoying it. I wanted to share our “trailing edge of luxury” story. In July, 2011, my husband found that we could buy a refurbished iPhone 3GS for $20 at AT&T. He ordered it, but because we were moving, our credit card zip code did not match the shipping address zip code, so AT&T refused to ship it. When we got moved, he went online to order it again, and found that the price had dropped to $10! Been a faithful reader of your blog for a few years now and thought it might be a good idea to start at the beginning for a refresher course. Your thinking process really makes the difference, IMHO, when it comes to living the good life. I followed similar steps when our bread maker went to toaster over heaven. We ended up buying a never-used $200 bread maker off Craigslist for $10. It really doesn’t cost much to live well in America. I’m thinking a $20k car new, purchased outright. Even if you end up paying for two used cars within that ten year period, say the second one at year 5 and they both cost $10k each(including any weird repairs), then you would still be saving money. It’s all about what that extra $10k could be making for you in those 5 years. At 5% that $2.7k right there. You definitely don’t need to ride in a clunker with horrible gas mileage for $10k. I have not included the cheaper price of insurance for your vehicle, nor have I assumed you get ANY money for selling the 1st used car. There was a great article, or comment, on this somewhere here on the site, but I can’t remember the link. Main idea – you can make money with that money you’ll otherwise spend on a car. I’ve recently started reading your blog from the beginning. Well done! One issue I and many wannabe mustachians face is that so many industries build products with planned obsolescence. Cell phones are built with non-serviceable batteries that loses half their capacity within 2 years, physical buttons that get stuck or jammed after a finite number of presses, paint that flakes off — all of this leading to forced upgrades within 2 years. Same applies to electronics; TV sets have become so mass-manufactured that components are glued together and sometimes impossible to maintain. Planned obsolescence is also rampant in the clothing industry. Modern clothing seems to wear out faster than the clothing of 20+ years ago. While electronics are a lost cause, maybe there’s a business opportunity here for a fashion-forward person to create trendy clothing that would stand up to a couple of years of daily use…? I bought a tuxedo from a tuxedo rental company when they advertised that they were clearing out old styles. It was complete with shirt and suspenders. Since it has a double breasted jacket I think it has stayed roughly in style so I can still look like 007 (Sean Connery, not the later versions). My wife and I are into ballroom dancing, so I get to wear it three or four times a year when we go to formal, fund-raising dances and of course on New Year’s eve. It cost me about 250 dollerettes (Canadian dollars)12 years ago. It still looks great! I think it’s the most mustachian investment I’ve ever made. I love your philosophy of buying things used. In fact, before I had kids I made most of my overpriced groceries (organic bread, yogurt, etc.) from scratch and would spend tons of time on Swap pages to find items used. However, since having kids, I am finding it nearly impossible to find the time to do these things. We still only eat out once a month (and brown bag every lunch), but I find myself on Amazon a lot more often. I literally have no more time to give for research/stalking Craigslist, or even the extra 20 minutes it takes to communicate logistics of a meet for an item and pick it up (it saved me $1.50, but was it really worth my 20 minutes?). I am a full-time working mother, and every moment of free time I have goes to spending time with my kiddos or exercising/cooking when they are asleep. Any tips for getting used items without spending more then 10 minutes accomplishing this? When I was last shopping for a used car , I went to cars.com to look for my favorite model. I decided that I could drive 250 miles to buy a car, and that put 67 cars in my list. Of course the mileages and prices were all over the board. So I considered that the google people would say “develop a formula then execute that formula many times over (which is what computers are good at ). I considered that I would keep the car until 150k miles at which time it would be worth zero dollars. So I took 2 data points from each acceptable car (not black ’cause I live in a hot desert) and entered the 2 points into a spreadsheet (price and miles) my formula is “cost per mile” = (cost / ( 150,000 – (miles on the car ) ) ). I sorted the table by the cost per mile and the cheapest car jumped out on top at 7 cents per mile. The seller paid over $1 per mile for the privilege of driving a new car 2,000 miles per year for 5 years. I’ve been driving that car for 8 years. I consider that the cost of upkeep will be relatively similar for similar cars, and it is too complex and of low value to get into predicting that. I love my van. It is roomy, versatile, dry, and secure. I can’t imagine working without it. I don’t understand why pickups are so popular, and don’t get me started about the crazy SUV craze! Well MMM, I know this is nearly a billion year old post (what with the exponential rate changes and all) but I just wanted to let you know I made the single greatest purchase of my life. A 1999 Honda Odyssey LX that was about to be traded into the dealership by my wife’s Grandmother. The sales person offered the take it or leave it price, and I decided I would match her offer in cash and buy the van instead of trading it in. $600. We currently use it 2 times a week to bring a trailer full of produce in to the local Farmer’s Market to sell. Greatest purchase ever. Six Hundred Dollars. That is crazy – isn’t used vehicle depreciation on certain cars irrational? And meanwhile, 1999 Jeeps hold much more of their value despite being far less well-made machines. Hell, even if the van didn’t run it’s worth more than that as a storage shed or uber-tough guest bedroom. Plus, the 4300 pounds of mostly-metal (including an aluminum engine, brass radiator, and wheels and tires you can sell separately, alone would be worth more than $600). OK. What if the thing you want to buy is going to help you save money? In this case, a double bike trailer for my 1 & 3 year olds. And what if I want it right away so that we can a) start saving gas/maintenance on the car(s) money right away and b) get the most out of it this summer now that the weather is changing (I’m in Toronto). I’ve been trolling craigslist/kijiji, but am not keen on the ones I’ve seen so far. I’m thinking a Burley for payload space. Thoughts? PS. Just discovered your blog about a week ago, and my hubby is calling it my new religion. He’s on board, but he takes a higher ground – he’s all in for doing the right thing, and saving money is clearly connected to saving the planet, which you point out so succinctly in your writing. Thanks for the fun and informative reads! In general, the time you are willing to scope out Craigslist should depend on the cost of what you’re buying, potential savings, etc. For a car, I’d gladly shop for 6 months if it helps me learn the market and save a few thousand dollars. For a bike trailer, you might only put in 2-4 weeks of scanning. But note that a Burley D’lite is usually $100-150 on Craigslist and $600+ new, so it’s definitely worth waiting for. In general, a bike trailer is a hugely profitable invenstion/investment though, so I am excited for your improved future of less driving in car-hell Toronto!